Kids get sick, it’s an unfortunate fact of life. There are somethings you should be aware of when it comes to giving them medicines. First and foremost, kids do not get aspirin. Aspirin has been linked to giving kids Reyes syndrome. It’s a rare but fatal disease. Most of us grew up being able to take aspirin, the “rules” until 1986. Of course, we were also put to bed on our stomachs, and out of a car seat around age two. Things change, usually for the better. Adult medications should be saved for adults. You might think it goes without saying, but adult medications should be saved for adults. The concentration of the medications are different so most adult medications are more potent than those made for kids. Even if you think you are giving them the same dose, you might mistakenly over dose them. This is also true for child versus infant medications. When dosing out your child’s medication, always use the weight chart instead of the age chart. Kids come in a plethora of shapes and sizes, a small two year old might end up with too much medication if you go solely by her age. For good dosing guidelines Playdate has most common medications and their dosage by weight (See Medication Dosages). I have it bookmarked for quick reference. Of course, you can always call your doctor and ask them as well. Better safe than sorry after all. And trust me, they won’t mind you calling, they prefer nice easy simple questions like how much medicine to give than you calling to inform them you’re on the way to the ER with a child with a drug overdose. When dosing out your child’s medication, always use the weight chart instead of the age chart. 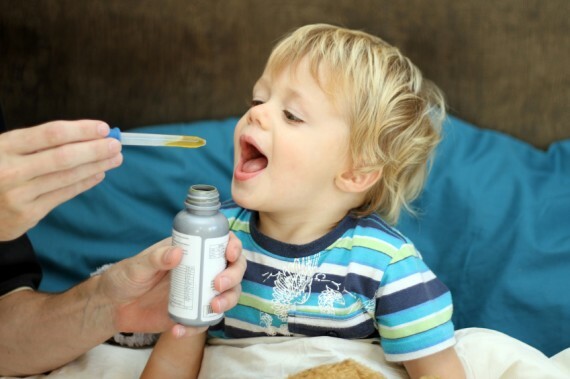 Make sure you have medicines that are appropriate for you kids too, for example, I could probably give my five year old a chewable, but my two year old would most likely try to swallow it whole. Or spit it out before getting it all in his system. As with all medicines, make sure to check out the expiration dates. It’s not something we always think about, but they do expire and not only can they become ineffective once they expire they might even make things worse.